The Washington Capitals defeated the visiting Phoenix Coyotes 4-3 in front of the 115th consecutive sellout at Verizon Center. The big news before the game was that Alexander Semin was a healthy scratch for the first time in his career since his rookie year (2003-04). Some fans were angry and some even cheered when the scratches appeared on the scoreboard. Semin was at Verizon Center, however, did not speak to media. Caps fans started to feel uneasy when the Coyotes took the 1-0 lead with a shorty on a Carlson turnover. With only 54 seconds left in the first period, Matt Hendricks and Kyle Chipchura dropped their gloves and got the quiet crowd fired up. Having received five minutes for fighting, Hendricks exited the rink for rest of first period. Before skating off, Hendy gave the Caps bench a look as if he was saying, “Okay guys, I got it started, now do something with this energy.” “I was just trying to get a little spark going,” Hendricks said. After starting the second period with Lauri Korpikoski scoring on penalty shot and Yotes up 2-0, everything turned around for the Caps. Hendricks’ fight did spark something. The first “rally balloon” (more on rally balloon later at end of post) was spotted and then John Carlson put the Caps on the board with a long slapshot through a lot of traffic. 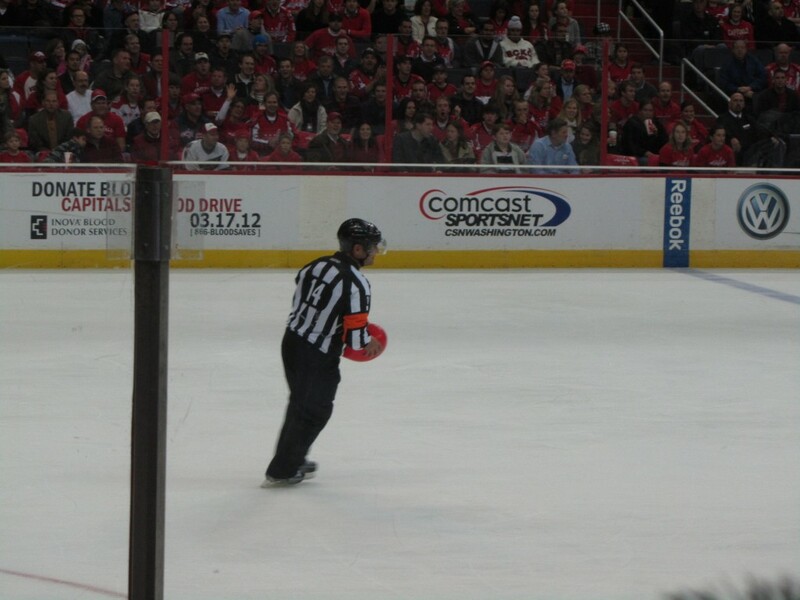 The second “rally balloon” was on the ice and Verizon Center crowd booed the ref when he removed the red balloon. Immediately following, Cody Eakin scored his first NHL goal at Verizon Center and his second career goal from a Schultz assist. The Caps played a strong third period and scored another two goals. Backstrom scored with assists by Ward and Ovechkin and Brooks Laich scored a much needed power play goal (5-on-3) which turned out to be winning goal. Several of the Capitals weighed in about the win and their play performance after the game. “We’ve got a lot of leaders in this room. A lot of guys say the right things. It’s a matter of getting everyone on the same page and doing the right things,” stated Matt Hendricks. The “Rally Balloon” = Two red balloons found their way onto the ice during the second period and fans decided to give the “rally balloon” credit for the Caps’ spark and win. It has taken on a life of its own already. The rally balloon already has its own Twitter account and t-shirt. Check out the balloon in action…. Tonight also marked Jason Chimera’s 600th career NHL game. He made his NHL debut on Dec. 9, 2000 while with Edmonton in a 4-2 loss to Los Angeles. In case you live under rock, Sidney Crosby played in his first NHL game this season and played well. Alex Ovechkin was asked about Sid’s performance tonight and was very gracious. Tonight’s game was part of the Hockey ‘N Heels event. Bring your canned goods to the next game, Wednesday, Nov. 23. First 2,000 get a John Carlson poster.